In the mid-1970's, astronomers studying the Cosmic Microwave Background radiation to study the large scale homogeneity of the Universe discovered a startling dipole pattern on the sky. Indeed more modern observations with the COBE (Cosmic Background Explorer) satellite have shown this to be essentially a perfect dipole. The amplitude of the dipole is only 3.358 +/- 0.001 milli Kelvins in the direction (l = 264.31 +/-0.16, b = +48.05 +/-0.09, Galactic coordinates, or RA = 11.199 h , Dec = -7.22, celestial coordinates). The dipole was almost immediately interpreted as a motion of the Milky Way or the whole Local Group. In raw form, since the observation is made from the solar system, its amplitude is only about 369.0 +/- 2.5 km/s and is in a direction almost opposite the rotation direction of the Sun around the center of the MW. After correction to the reference frame (barycenter) of the Local Group of galaxies, however, the velocity amplitude rises to 627 +/-22 km/s towards (l = 276 +/-3, b= +30 +/-2) where the increase in the uncertainty is due to the uncertainty in the coordinate transformation (c.f. Lineweaver 1996). Even before the discovery of this dipole motion, astronomers had been "sniffing" around the idea that the expansion of the Universe might not be uniform, especially on small scales. For example, we know that the Local Group of galaxies is bound and therefore the galaxies in it are not participating in the global expansion at least relative to each other. We also know that galaxies in the cores of rich clusters of galaxies are bound to those much more massive objects and are in orbit around their centers with "peculiar velocities" that are substantial, thousands of km/s, such that in the nearest rich cluster, Virgo, the gravitationally induced velocity can dwarf the "Hubble" velocity (the velocity due to the expansion of the Universe). In the early 1950's, Vera Rubin (1951) first attempted to measure peculiar velocities in the nearby Universe, and in the mid-1950's Gerard deVaucouleurs (1956, 1958) hypothesized that the Milky Way should actually be falling into (i.e. expanding away from more slowly) the Local Supercluster (c.f. the seminar projects on the Virgo Cluster and on the Local Supercluster). The fundamental idea here is that the non-cosmological motion of the Local Group would be caused by some large mass concentration pulling us towards it. In other words, Gauss's theorem says that if matter in the Universe were truly uniformly distributed there would be no net force on any galaxy, but since we know that the Universe is lumpy, galaxies will be accelerated by large masses such as othr galaxies, galaxy groups and galaxy clusters that are near them. Since the pull of gravity decreases as the square of the separation, nearby masses have a much greater effect than distant masses. Also, we still do think that on very large scales, in the words of Edwin Hubble, "the Universe is sensibly uniform." Given that, the first place astronomers looked for the cause of our motion w.r.t. 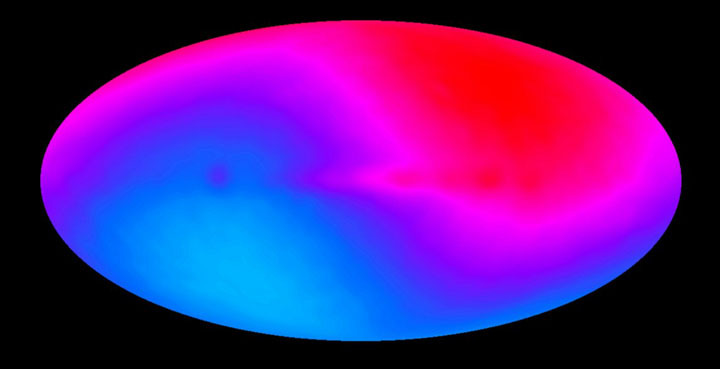 the CMB was the Local Supercluster following deVaucouleurs (c.f. Schechter 1980; Davis et al. 1980; Aaronson et al. 1982). The Local Supercluster dominates the galaxy distribution inside a distance of a few thousand km/s (40-50 Megaparsecs or 120-150 million light years). We found a definite "flow" into the LSC, the Local Group is expanding away from Virgo about 250 km/s slower than it would be if we were freely participating in the Hubble Flow, but that 250 km/s motion is much less than the ~630 km/s and not quite in the right direction. Since Virgo and the Local Supercluster can't do it, astronomers looked for bigger things further away. The purpose of this project is to study the properties of the Great Attractor (GA) with a new and deep all-sky survey of galaxies, the 2MASS Redshift Survey (2MRS). We will measure several global properties of the GA, including its size and shape. We will examine maps of the distribution of galaxies in this supercluster and the distribution by morphological type. 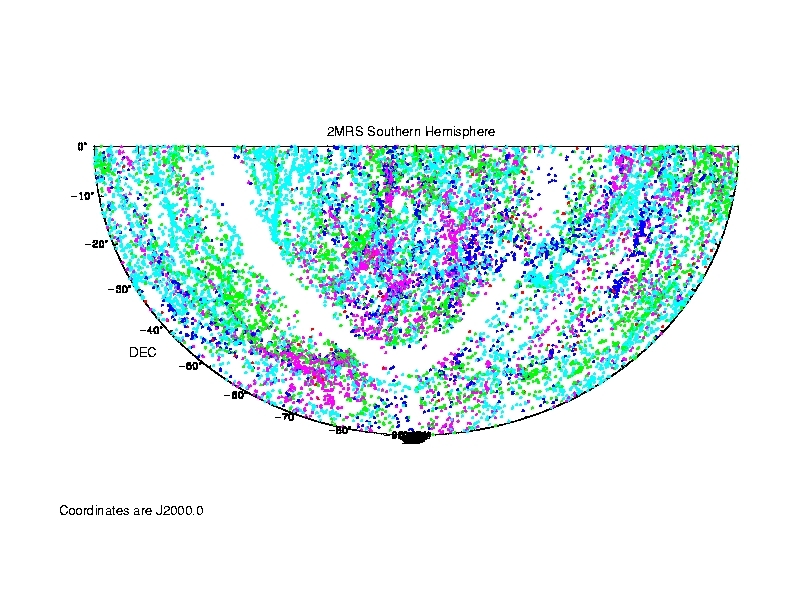 Here's a plot of the positions on the sky, in standard celestial coordinates, from a program called "map". This plot shows an equatorial coordinate projection of all the galaxies in the 2MASS+6dF Redshift survey inside an apparent heliocentric radial velocity of 10000 km/s and below declination 0 degrees. Velocities are color coded: Red V < 1000 km/s, Blue 1000 < V < 3000 km/s, Magenta 3000 < V < 5000 km/s, Green 5000 < V < 7000 km/s. The data file contains all the galaxies in the southern celestial hemisphere and includes what we think is the center of the Great Attractor. The columns in the ascii file are labeled with their contents. There are about 38,800 galaxies in this catalog. This file contains all the galaxies within about 10000 km/s of the Milky Way, in the southern celestial hemisphere and brighter than a limiting apparent K-band magnitude of 12.5. Note that not all the galaxies in this catalog are actually members of the GA! These galaxies were selected from a survey centered on (by definition!) the Milky Way. Once you have transformed the objects into the x,y,z of the Cartesian system, you can transform again to the center of the GA just by adding or subtracting (as appropriate) the x,y,z of the GA. Then you should "trim" the sample so that you look at (analyse) only those galaxies that are within some distance (perhaps 3 to 4 thousand km/s) of the GA.
A very useful thing to do is to plot the data in various ways. One might be to transform the coordinates to the supergalactic system of dV et al. and plot our catalog in that system. Look for a way to simply transform our catalog into those coordinates, much the way we transformed RA & Dec to Galactic L and B. But you should think about coordinate rotations. Also remember that we see more of the near side of the GA than the far side. What are some of the questions we want to answer and how can we do that? 1. Is there a better definition for the center of the GA (now that we have a survey that really probes the whole sky?) How far off is the center you derive by looking at the data from A3627? 5. Can you estimate the mass of the GA? (hint: use the projected mass estimator defined on the Virgo Cluster project web page). That's because we're not in the end looking all the way to 10,000 km/s but only 4000 + 3000 km/s. Note that 12.5 is the magnitude limit of our survey (see above). Thus you can construct a magnitude limited sample by calculating the absolute magnitudes of the galaxies in the survey using the equation above and then creating a new sample, centered on the GA, but cut to be brighter (more negative) than -22.0. That will be a sample smaller than the one you ended up with after the coordinate shift and radial cut, but it will uniformly sample the volume. Now that you've transformed the coordinates to the center of the GA and created a volme limited sample, remap the LSC and see if you can determine size, shape, radial density profile, etc. Remember that if you create "rings" around the GA to do the density vs r, density will be measured in projection, i.e. as the number of galaxies per Megaparsec squared since we've integrated in the z direction. Good luck! Aaronson, M., Huchra, J., Mould, J., Schechter, PO. & Tully, R. B. 1982, ApJ 258, 64. Abell, G., Corwin, H. & Olowin, R. 1989, ApJS 70, 1. Dressler, Alan (1994) "Voyage to the Great Attractor: Exploring Intergalactic Space. New York: Alfred A. Knopf. pp. 355. ISBN 978-0394588995. Junes, D. H. et al. 2009, MNRAS 399, 683. Lineweaver, C. 1996, Astroph 9609034. Rubin, V. 1951, AJ 56, 47. Schechter, P. 1980, AJ 85, 801.